Russell Williford was born April 2, 1933 in Dunn, North Carolina. His family moved to Norfolk, Virginia soon after WWII started because of the work and shipyards there. When he was ten years old, Russell taught himself how to play guitar. He served in Korea from 1953-55, and there he played with Roger Miller on a radio show in Seoul for the soldiers. In fact, Russell still has a rare, unrecorded reel-to-reel Roger Miller song from their days together in Korea. When he came back to Norfok, he played at local clubs and met Tex Davis. In those days Russell played a 1953 Fender Squire, and he and Cliff Gallup had a reputation as being the hottest guitar players in the area. When Cliff left The Blue Caps, Tex asked Russell if he would meet Gene Vincent in Washington, DC for a show at the Casino Royale and then go to Hollywood with him to do the movie "The Girl Can't Help It." When they arrived at the Los Angeles airport, they met Elvis Presley and took pictures with him. After doing the movie they played the Shrine Auditorium in Hollywood and the Paladium in San Diego. Then they went east to Connecticut, Pittsburgh, Buffalo, and into Canada. After that, Gene took some time off; the record label wanted Cliff to do the next album, but Gene came back to Russell to go with him to Las Vegas where they played until they had to cancel the last few shows due to Gene's leg problems. 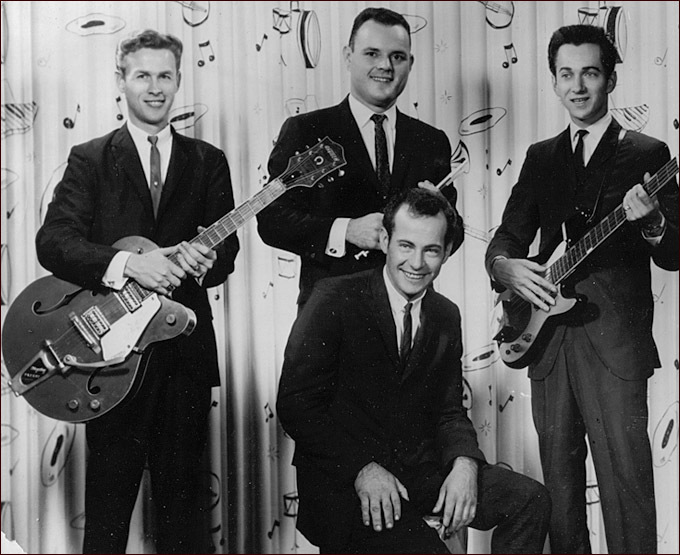 In 1957, while Gene was healing, Russell put his own band together called Russ and the Go Boys (later changed to The Go Boys), and around 1959 they recorded some songs in Washington, DC. 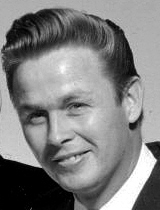 Russell and the boys played the Baltimore/Washington, DC area, and there he met and became friends with Roy Clark of "Hee Haw" fame, Jimmy Dean of "Big John" fame (as well as the "Sausage King"), and Charlie Daniels. Later, in 1961, Go Boys evolved into The Palisades, and in 1961-62 they played the world-famous Copacabana in New York City, where they played shows with Wayne Newton. 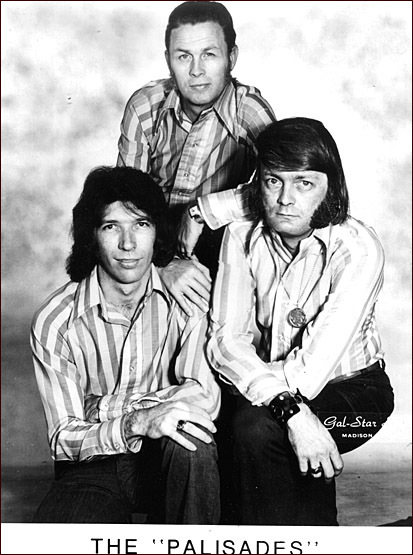 They also made a few recordings; their biggest hit was "Lean Hornet," which got moderate airplay. 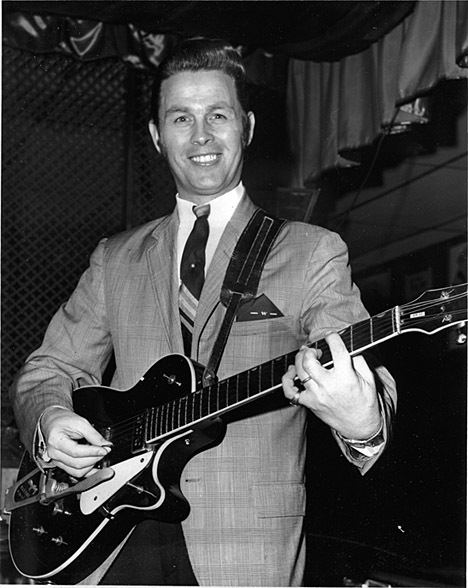 Russell was well known on the East Coast and was called to fill in at shows in the 1960s for Patsie Cline, Lefty Frizzell, and Tommy Cash. Russell would not see Gene again until early 1971, when Gene walked into a club that Russell was playing in Norfolk and got up on stage and did three or four rockin' songs. Afterwards he gave Russell a copy of his new album on Karma Sutra records and asked Russell if he would join him if Gene could get the Blue Caps back together. The Palisades ten-year run was nearing its end, so Russell agreed to join him. But Gene died a few months later. After the Palisades broke up in 1972, Russell moved to Nashville and played the Grand Ole Opry with Tex Ritter. Playing the Grand Ole Opry nearly every week, he played with Little Jimmy Dickens, Jean Shepard, the Wilburn Brothers, Justin Tubb, and others. He also toured with Tex and did some session work with him, and from 1977-1979 he joined Stonewall Jackson and played with him as well. Russell has always been a songwriter and has written hundreds of songs. He had a moderate hit in 1977 with "Walk Out on Me," sung by Charlie Borchert, bass player for Stonewall and cousin of Bobby Borchert. In 1981 he moved back to Norfolk where he has been writing songs and playing music till today. Dickie Harrell and Jack Neal have come out to hear him play, and the three of them still remain good friends. 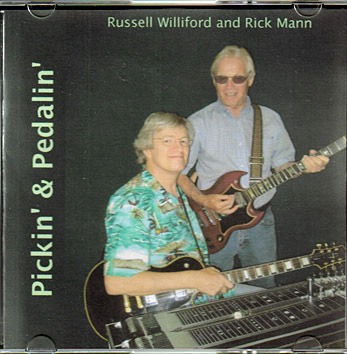 Recently, Russell made an instrumental CD, called "Pickin' & Pedalin'," which includes a Gene Vincent medley featuring "Bee-Bop-a-Lula." Introduction - the following interview took place in 1991 when Steve Aynsley, Roger Nunn, John Braley and myself (Robert Erskine) ran The Gene Vincent Fan Club. My responsibility, within the club, was to contact people associated with Gene, mostly in the USA. The 'Git It' magazine stopped being issued around 1990/91 and the following interview, which I collated, was never published. The interview was in the form of a questionnaire which Russell replied to via cassette tape. So little, even today, is know about Russell and as you will read he has been very active in the music business, since his time with Gene. 1 RE What is your full name and spell surname? 2 RE Date of Birth? 3 RE Place of birth? 4 RE How did you become interested in music? RW Back in the 40's my father had a radio, a battery radio and we used to pick up the Grand Old Opry on a Saturday night. I used to listen to that. 5 RE Who were you influenced by? RW At that time Roy Acuff and Bill Monroe. They were two of the biggest ones back in the early 40's. 6 RE When did you become interested in Rock N Roll? RW I guess in 1955 when it all started. Bill Haley, Elvis and of course Fats Domino and then along came Gene Vincent. 7 RE What age did you take up the guitar? RW I guess I was about 10 years old when I started playing the guitar. 8 RE In what group were you playing when Bill Davis approached you to fly to Los Angeles to appear in the 'Girl Can't Help It'? RW I was working with a group called The Sunset Valley Boys and the leader of the group was Carolina Charlie who was one of the leading D Js round here for years on WCMS radio. 9 RE How did Bill Davis know of you? RW Well I guess it was through Carolina Charlie who also worked at WCMS. 10 RE Were you a regular around WCMS Radio Station at this time? RW No, I'd been there several times but I didn't really have anything to do with WCMS. 11 RE Where were you living at this time? RW I was living in Portsmouth, Virginia, the same area that Gene Vincent came from. 12 RE Did you know Gene or any of The Blue Caps before meeting them in LA? RW I'd heard of Gene and I knew his record was doing good but I'd never met him. I had met Dickie Harrell before and a couple of other guys in the band but I didn't know any of them really personally. 13 RE How long did your association with Gene and The Caps last? RW Well I don't really know how long it was. When I flew out to California, of course we did the movie and then we played the Palladium out there in San Diego and then we drove back and did some shows in Pennsylvania. We drove up to Canada, to Toronto and the Ford Theatre. We did two or three weeks and then I left Gene. It must have been six months later Gene called me and asked me did I want to go out to Vegas with him and at this time he was going to use two guitar players. He had Rabid Neverley who lives here in Portsmouth too, he was going to play guitar and so was I. We all left and drove out to Vegas and worked the Sands Hotel out there. I think we worked three weeks and Gene's leg started hurting real bad and we had to cancel the last date. My association with him was quite a while and I really enjoyed working with Gene. c.	Photos from the actual film itself. a and b were probably taken by Ken Veeder. Can you recollect any other photo sessions? RW Yes, one I have in mind and I'll always remember is when we were going out to California to 'The Girl Can't Help It'. As we were getting off the plane Elvis was leaving Los Angeles and we met him on the ramp and he and Gene talked for a few minutes and Gene introduced all the band to Elvis and we shook hands with him and there were pictures being taken all this time. So I guess thats one of the most notable ones I really remember. 15 RE Do you have any other photos from this time? RW No I don't. The one you sent is the only one I have. I really wish I had collected all the stuff we did. 16 RE How did you get on with Gene and the Caps. Was it fun? RW Yes, we all got along great and Gene was great to work with. He was a real good friend of mine and like when we were going out to Vegas we would stop out in the desert have fun and he was never in a hurry and made sure everyone had a good time. 17 RE What are your memories of the actual filming? RW Well the thing about it, it took so long about four hours to film our whole part. They kept doing it over and over and I couldn't believe it would take that long to film. 18 RE Have you any funny stories from this period? RW No I don't have any but I'm sure there were plenty of them. We were always joking. 19 RE Did you see any other artists who appeared in the film? RW No we didn't see anyone. We all filmed at different times. We did see Jayne Mansfield in the Twentieth Century Fox cafeteria. She was the only one we did see. 20 RE Can you give ma any reminiscences of Bill Davis and Red Gwynn? RW Yes, Bill Davis is a very likeable person. He was a good manager for Gene and a real business man. Bill and I are still great friends. He was A & R man at Monument Records in Nashville and I was in Nashville about two years ago and did some session work for Bill. As of Red Gwynn I never knew Red that much. I had met him but didn't really know him that well. 21 RE Were you disappointed that the film sequence of Be Bop a Lula was edited to pieces? RW Yes, I was. I feel that Gene got slighted in the movie compared to the rest of the artists and Gene at that time was really bit and doing great and they showed just a few little clips of him while the other artists that weren't as well know as Gene got a lot more film time. 22 RE Was Tommy Facenda friendly with Gene at this time? RW Yes, they were always hanging out together. He wasn't in the band at this time but they were real close. 23 RE Did you get to know Eddie Cochran? RW No, I never met Eddie. I think we did a show with him in Pennsylvania but I never met him personally. 24 RE Did Gene become particularly friendly with Eddie at this time? RW Yes, they always seemed to be real good friends and I think when they went to England they became greater friends. 25 RE When you were brought in to appear in the film was it on the understanding that it was a 'ONE OFF' deal or were you told that if you proved satisfactory musically you would replace Cliff Gallup in the group? RW No, when they called me to got to California to do the film there was not talk of a deal or prove satisfactory. There was nothing like that. 26 RE When and how did you decide to leave Gene? RW Well, it was just an agreement between me and Gene. When we left Toronto, Canada Gene took a little time off. His leg was real bad and at this time I had just got out of the service and bought a new guitar and I was kind of wanting to stay round the Portsmouth area and I guess it was a mutual agreement. As I said before a few months later I did go back with Gene and went to Vegas with him. 27 RE Were you aware that your photo appeared on some LP covers with Gene? RW Yes, I've seen some of those. 28 RE What did you do when you went back home i.e. did you play professionally? RW Yes, I did, I played in night clubs round the Norfolk/Virginia Beach area and I played six nights a week. I've always been in music and that all I've ever done. \ RW Yes, Dickie Harrell and I are real good friends. We see each other every once in a while. He still works round in the Norfolk area, a couple of nights a week and I think he has his own group. 30 RE Did you follow Gene's career? RW Yes, I did try and keep up with Gene but once he went to England for such a long time I didn't hear quite so much about him over here in the U S. I did hear good reports of him. Like I say I saw him later on in the 60's. 31 RE Any other comments or reminiscences on your Blue Cap connection? RW Yes, there is a lot. I think we played a show in Stratford P.A. and we couldn't leave the front of the building, the kids were screaming, we had to duck out the back and they were chasing us as if we were stars instead of just musicians. They had us signing autographs and then started to tear our clothes off. So all along we had a great time. It was a great era. 32 RE How did you meet Dudley Callicut? RW Well that involves quite a long story. I was working a night club in Washington D.C. and Rudi Callicut, Dudley's cousin was a producer up there. He also worked in the Pentagon, he cut hair there, a barber who cut Generals' hair. We met Dudley through Rudi. 33 RE How long did you play with the Go-Boys? RW Well I guess probably around three years. We played clubs in Washington and cut a bunch of records up there. Also we played along the east coast and different clubs. Rudi booked a lot of shows for us but mostly it was just night club work. 34 RE We know that the GoBoys recorded 'Heart Trouble', 'Get Ready Baby' and 'Ramble'. Were there any other recordings made? RW Yes, we made a few more but to tell you the truth I don't know what they were. I cut quite a few records when I was in Washington but I never kept the material that I did. 35 RE From 1960 can you fill me in with the Russell Williford story i.e. details of family, what employment you had and what you work at now? 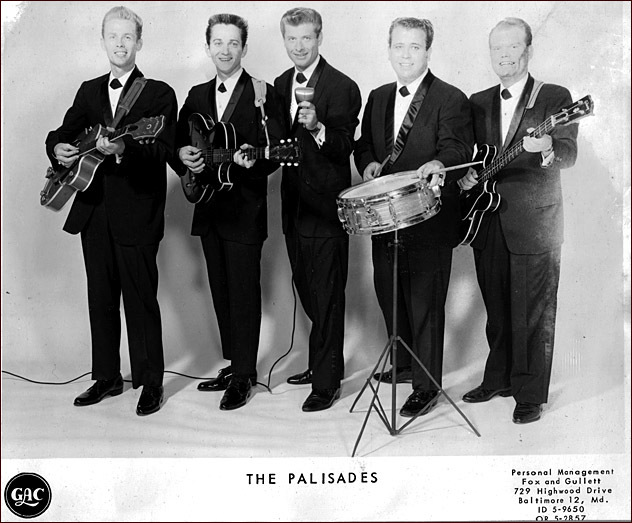 RW In the early 60's we formed this group called The Palisades, the leader of the group was Rudi Wesley who was an outstanding singer. We did all kinds of music. All the top stuff like Bobby Darin, Gene and worked some of the biggest clubs in the United States. We worked the Copacabana Club in New York City which was at that time the most popular club in the U S. We were booked two weeks but stayed for seven and at this time Wayne Newton, one of the biggest acts in Vegas was working opposite us. We also worked the east coast a lot of places like Wildwood, New Jersey in the Manor Hotel there. It was the biggest supper club on the east coast. We were there for a month. We also repeated at the Copa again in 62 or 63. We were there for seven more weeks. Then in 1964 we worked the famous Peppermint Lounge for four weeks and were also the backing band for other artist. At this time too we worked in Greenwich Village. The Palisades stayed together for close to ten years and split up in the late 60's. 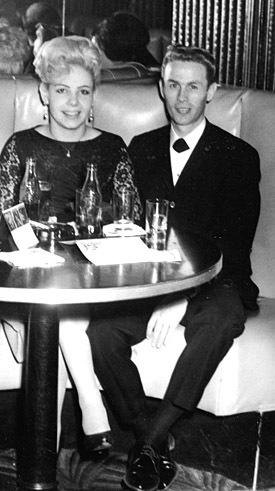 In 1962 I got married and have four boys. Two of them are now in Nashville with their mother and two are here in Virginia Beach with me. In the early 70's I moved my family to Nashville, Tennessee and the first couple of weeks a friend of mine who plays guitar got me a job with the Great Tex Ritter who is now passed away and I did some shows with him Then I went to work with the great Stonewall Jackson in 1974. I did the Opry and then I left Stonewall and played with a lot of groups out of Nashville for about three years. In 1978 I went back to Stonewall and worked with him for two years. I ran the band for Stonewall. I did all the hiring and firing. This was all left up to me. My greatest thrill was working the Grand Old Opry for two years and it is a great thrill to walk out on to that stage realising all the other great people who have been there before you. I left Stonewall again in 1980 and me and some of the men who fronted Stonewall put our own band together and cut a couple of records which did fairly good for us. We worked out of Nashville and round the Florida Keys a lot especially the Holiday Island Hotel. We worked this club for a couple of years on and off. In 1984/85 I came back here to Norfolk, Virginia and I work the clubs around here 5/6 nights a week. I still get the urge at times to go back to Nashville. 36 RE Did you know that the Blue Caps occasionally perform and have appeared on three tours to the U K in the last ten years? Dickie Harrell and Paul Peek would be the ones still in the band known to you. RW Yes, I had heard they have been over on tour and that they had a great time. I know of Johnny Meeks. I don't know him but he is a fine guitar player. 37 RE I take it that you know Cliff Gallup passed on a couple of years ago. How did you rate his guitar playing? RW I was really shocked when I hear that Cliff had died. He was very young still and I rate his guitar playing as one of the best. he was a very fine guitar player who had a style of his own. His playing was very clean and was ahead of his time in his playing. 38 RE Although Gene's career faded early in the States he remained very popular in Europe and the U K. Were you aware of this and also that the name of Russell Williford is very familiar to British and European Rock N Roll fans and collectors? RW I knew Gene was really popular in Europe and I was very pleased that he did so great over there. As for me its an honor to think that people know of me. I would like to say Hi to the fans who know of me over there and I appreciate the fans are still behind the great Gene Vincent. 39 RE Can you repeat the story told to me in your letter of Gene in 1970 coming to the club you were playing at in Virginia Beach and singing a few numbers with your band? RW Yes, I was working this club I was telling you about withe the Palisades and I was shocked to see Gene walk in, oh I guess it had been twelve years and I don't know how he found out where I was playing at. It was great to see him and he came up to sing several songs with us and stayed around till we finished that night and we went off together and had breakfast together and we talked a long time and reminisced about old things and he was telling me he would like to put The Blue Caps back together and he asked me would I be interest in going back out on the road and doing some shows because at that time the 50's bands were coming back strong, Chuck Berry and a bunch of others out working clubs and shows again, it was coming back pretty strong, so I told him I would be really interested, so he said he would see me in about six months and about six months later he came back a second time and he said he was working on things and getting things ready, they were going out to California and he would be getting back in touch with me but meanwhile this was about 71. I moved to Nashville, Tennessee the same place as his ex-manager Bill Davis was at, at Monument Records and I was there and Bill called me one day and told me that Gene had passed away that he had died on the operating table from a bleeding ulcer. I was really shocked because I was looking forward to working again with Gene. He seemed so enthused over it and I think he could have come back strong in the States but his untimely death took that away. 40 RE This story tells me you still play music. Are you still playing gigs and if so what king of music do you play? RW Right now we are playing top 40 country stuff. Of course we play a variety of stuff, we play some 50's stuff, we still do that but the majority of that is the modern country stuff. 41 RE When and how did you hear of Gene's death? RW As I said I hear it from Bill Davis as I was in Nashville and he told me of Gene's death. 42 RE It is amazing to think that 'THE GIRL CAN'T HELP IT' was 35 years ago and in fact Gene is 20 years dead this year! Would you say life's been good to you. Any regrets? RW Yes, I would say life's been good to me. I have four wonderful sons - Rusty, Ricky, Robbie and Randy and we always have a wonderful time playing music and I really enjoyed my time with Gene and I've played all over in the United States, Canada and as I said I worked some of the biggest clubs in the U S and I've backed up so many artists on the Opry. I guess the only regrets I really have is that Gene died before we could get back together as he planned it when he came back in 70. I think we could have topped it off with The Blue Caps going again. I think we could have taken the States by storm. Yes he had great ideas of what he wanted to do and it's just a shame he had to pass away so darn young. While I'm closing here I would like to thank you personally Robert. Its been my pleasure doing it and I really appreciate what you are doing over there keeping Gene's name alive and you just wouldn't believe things are still going strong after all these years. It takes people like you to do these things and I hope in the future I can come over there, work with a group and play a tour with you. I'd really love that and once again 'THANKS A LOT'.